Théodore Géricault painted Raft of the Medusa in 1819. The painting hangs in Room 77, also known as the Salle Mollien, on the first floor of the Denon Wing at the Musée du Louvre. The room contains large-scale French paintings from the era of Romantisism, Companions of Géricault's masterpiece include another well-known work of the time, Eugène Delacroix's Liberty Leading the People (1830). Raft of the Medusa was presented at the Salon of 1819 and, as the credit reads, was "Purchased at the artist's posthumous sale through the intermediary of Pierre-Joseph Dedreux-Dorcy, a friend of the artist" in 1824. Many of us can roughly limn Géricault's famous painting almost from memory. It features a striking composition: a human pyramid with its apex located on the right side of the canvas, with the mast and sail of the ship rising in a slight, diagonal toward the left, counterbalancing the whole picture, out of a lozenge-shaped raft that juts out at the bottom of the canvas toward the viewer. At the highest point is a small cluster of men - a brown-skinned figure supported by two white men frantically signaling to a passing ship - and below them is a cluster of interlinked, intermeshed, sprawled figures, half-rising, falling, and barely propped up. There are about twenty figures in all. Amost half have their backs turned toward us in a collective upsurge toward that flickering hope of salvation, while another group of people looks with yearning toward the ship and at one another in the shadowy background. A couple of figures in the lower part of the picture present classical three-quarter and profile views: the painter is exercising his skills and perhaps reinforcing his academic pedigree with these figures, but they are jarringly out of place in this dizzyingly complex picture. Then we see two lifeless bodies, presumably corpses. One of them is supported by the patriarchal figure, arguably the only one that seems out of place in the picture; the other, its torso and body mostly veiled, is falling backward into a ruthless sea. At the far left of the picture, diagonally opposite the man at the apex, is a half-figure - his skin a putrefying green-gray, head tilted back, and left arm locked in rigor mortis. Most horrifiyingly, the rest of his body, from the lower half of this torso, just below the ribcage, is missing. The Medusa set sail for Senegal in July 1816. On board were a group of liberal abolitionist-colonists seeking to establish an agricultural colony and a ragtag delegation of soldiers of diverse nationalities and races from the wide stretch of of the French empire. Just a few days into the journey, the ship ran aground off the coast of present-day Mauritania. The Medusa had only six lifeboats, so passengers quickly and haphazardly constructed a raft measuring twenty by seven meter that could hold almsot 150 people. The majority of those on the raft were soldiers; there were also some artisans, a handful of low-ranking officers, and at least one woman. When the raft was rescued by another ship thirteen days later, only fifteen people were alive. Most of the survivors were officers, who had engineered both murders and suicides among the others on the impossibly overcrowded raft and had endured deadly hunger and thirst, multiple mutinies, and cannibalism. One account of the rescue by D'Anglas de Praviel, published in 1818, describes the men on the raft "lying on the boards, hands and mouths still dripping with the blood of their unhappy victims, shreds of flesh hanging from the raft's mast, their pockets filled with these pieces of flesh upon which they had gorged themselves." 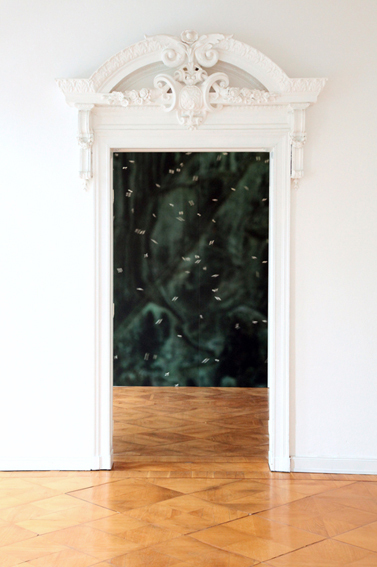 On January 25, 2011, Danh Vo and I visited the Louvre, and in the course of roving across the galleries, came upon a study for Raft of the Medusa in a temporary exhibition. One painting in the exhibition caught our eyes - Géricault's Anatomical Fragments of 1818, a study of dismembered limbs carefully arranged to appear either like a nature morte or a grim sceme of a crime or an autopsy. This is one of the many studies, paintings as well as drawings, the artist made. Choosing the international scandal as the subject of his work for the annual Paris Salon. Géricault knew what the stake were. He is said to have visited morgues and hospitals to study copses. In the final painting, however, cannibalism, the most unsettling and aberrant human behaviour, is almsot completely sublimated. One art historian explains that Raft of the Medusa is not so much a representation of the event as a reconstructed ideological statement on the politics of race and class in the early nineteenth-century French empire. She provocatively argues, "Here are interwoven bodies of disheveld soldiers and naked slaves and cannibalized men - all partly consumed persons. Here are stumps and limbs and backs of men inscribed, brutalized, and disabled by their history, and thereby - this is the picture's achievement - unified as a new mutually dependent collectivity in which old hierarchies do not hold." Raft of the Medusa is 491 centimeters high and 716 centimeters wide. Théodore Géricault was born in Rouen in 1791 and died in Paris in 1824 at the age of thirty-two. The next day, Vo and I visited the Cimetière du Père-Lachaise, which he had roamed often during a residency in Paris a few years back. He showed me some of his favorite spots on this storied ground, such as the grave of Gertrude Stein. The gravestone of perhaps the most famous American expatriate in Paris is a simple one - a square stone engraved only with her name across the middle and her birth and death dates at the bottom. When her longtime companion, Alice B. Toklas, died two decades later, she was buried next to Stein and, in a gesture of affection, modesty, and perhaps mischief, had instructed that her name be engraved on the back of the tombstone. At least one of us had no qualms about being a tourist. I took Vo the mausoleum of Gioachino Rossini, we searched for the tomb of Jacques-Louis David but couldn't locate it and, in the process, ran into that of Jean-Francois Champollion, the decipherer of the Rosetta Stone. Then, unplanned, we came across Géricault's tomb. Despite or perhaps because of the romantically short and stormy life of the Romanticist painter, his tomb is a somewhat maudlin mausoleum by Antoine Etex (1808-1888). It consists of a brnze statue of the better-known and more accoplished artist reclining on his side on top of the mausoleum, his upper body propped up on his left arm, which is bent at the elbow. His left hand holds a palette, and his right hand a brush. The seemingly shaved head is held straight up and topped with a beret. All the stereotypical indicators of an artist are there. The front panel on the mausoleum reproduces the artist's most famous painting in a bas-relief. We should of course accept the fact that translating a painting into a cast bronze is not an easy process, but it is also obvious that this decidedly inferior reproduction appears cramped and slightly out of proportion. Etex's Raft of the Medusa bas-relief is 81,5 centimeters high and 127,5 centimeters wide. It is approximately 3,5cm deep, though depth varies across the sculpture. 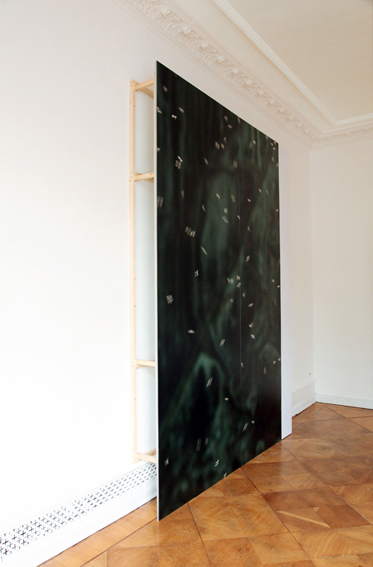 A few months later, on April 5, 2011, Heinz Peter Knes took photos of Etex's relief reproduction of Raft of the Medusa with a swarm of mayflies in front of it. Seeing one of the images for the first time, sent via e-mail, I thought: it is as if the horrifiying drama of death, cannibalism, and putrefaction has been reactivated. A masterpiece of painting, transferred to a bronze relief, and then revivified by a cloud of tiny insects. The mayfly is an insect that belongs to the order Ephemeroptera. The order name is a combination of two Greek words, ephemeros (short-lived) and pteron (wing), thus suggesting the insect's brief life span. To be more precise, the mayfly's life is short in its winged, final phase, but it lives for up to a year in its earlier stage which it passes in freshwater, when it is called a "nymph2 or "naiad." As a fully formed adult, it lives as long as a few minutes to a few days. The mayfly is also known as a "dayfly" and "fishfly". The former has counterparts in other languages that mean "one-day" or "one-day fly": Eintagsfliege in German and in Greek, efimeros, which is the origin of the French éphémère, the Italian effimera, and the Spanish efimera. In Korean, it is called harusari, which translates literally as "one that lives for a day." Aristotle's The History of Animals contains the first known mention of the insect. which circumstances it is called the ephemeron. While its individual life span and even full life cycle may be brief, the mayfly as a pecies has been around for a long time, predating the dinosaurs. Fossils of the insect have been found that are more than 300 million years old. Mayfly nymphs hatch from eggs laid in freshwater and molt twenty to thiry times over the course of a few months or up to a year. Unique among insects, the mayfly molts again after devloping functional wings. This penultimate stage - known as the subimageo or first flying stage - lasts for a very short time. At this point, the mayfly empties its gut and fills its midsection with air; it is extremely vulnerable during this time, as it is an attractive source of food for fish. Many fishing flies resemble the insect for this reason. Those that survive become adults - agos. During the final phase, they do not eat. Their mouths are vestial, their digestive systems are filled only with air, and their primary function is reproduction. Males generally fly in undulating swarms roughly five to fifteen meters above the ground. Females fly into the swarm and are quickly grabbed by the males. The males' eyes are large and their front legs are unusually long, features that aid them in locating and grasping females in midair. Swarming males are not very selective and have been seen trying to mate with other flying insects. Mayflies are also unique in possessing double genitalia - the male has two penises and the female has two gonopores. During copulation, the male simultaneously inserts both penises into the female's two openings. Sperm is transferred quickly and eggs are fertilized immediately. The male mayfly dies shortly after mating. Within minutes or hours, the female lays her eggs and also dies. The mayfly measures between 0,3 and 3,8 centimeters in length. 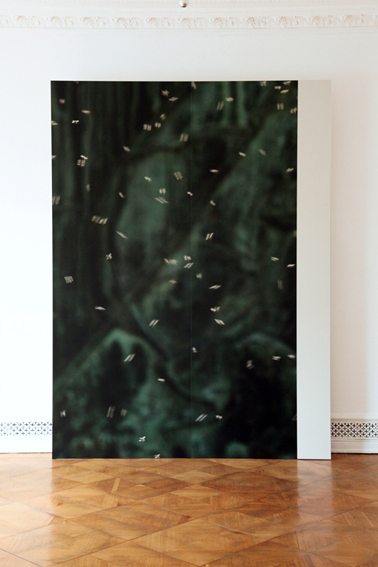 On April 20, 2011 Knes sent the cropped digital images of mayflies against the backdrop of Raft of Medusa relief to a professional printer, Pochron Studios in Redhook, Brooklyn, to be made into digital C-prints (chromogenic prints). The printer used a Durst Lambda 131 large-format digital laser imager and Fuji Crystal Archive Type-C Matte Surface paper. The digital C-print is made by exposing a sheet of type-C photographic paper to light inside a digital printer instead of to light projected by an enlarger. The digital C-print is then processed in a color processor just as a traditional C-print would be. Digital C-prints are also often referred to by the brand name of the machine on which they were printed, for example, Lambda prints. They are fully archival. The dimensions of the large prints roughly reflect the height-to-width ratio of 1 to 1,46 of the original Géricault painting (490cm to 716cm), with small variations. As the largest paper size used by the printer is 127 centimeters wide, the large image have been printed in two sheets. Of the five large-size images, crop2 was selected for exhibition. The third size, medium, was determined according to a different principle, the golden ratio. It is horizontally oriented, like Raft of the Medusa and unlike the large- and small-size photographic close-ups and crops of the relief reproduction and mayflies. The medium-size image is zoomed in and cropped further from img_9523_crop5. Its width is the same as that of an American queen-size mattress, which measures 153 centimeters wide and 203 centimeters long, at the ratio of 1 to 1,327. Two other ratios were considered in order to determine the height of the medium-size print. The height-to-width ratio of the original Géricault painting, 1 to 1,46, would have produced a height of 223,38 centimeters, and the ratio of Etex's relief, 1 to 1,56, would have come out to 238,68 centimeters. In either case, the dimensions would be almost as large as the large-size prints or the queen-size mattress and were thus rejected. Furthermore, as the vertically oriented image at those dimensions would be too imposing and out-of-scale over a queen-size mattress and in a standard bedroom, it was decided that the image should be horizontal and the height should be calculated using the golden ratio, 1 to 1,62. The height of the medium-size print is, therefore, 94,44 centimeters. Euclid is said to have provided the first written definition of the golden ratio, a so-called irrational mathematical constant: "A straight line is said to have been cut in extreme and mean ratio when, as the whole line is to the greater segment, so is the greater to the less." The golden ratio has not only continously fascinated and obsessed mathematicians; it has also been studied by numerous philosophers and artists. In the sixteenth century, philosopher Heinrich Agrippa drew a man inside a pentagram that was in turn inscribed within a circle, and Leonardo da Vinci, perhaps most famously, illustrated polyhedra and the human body's relationship to them in De Devina Proportione (1497), written by Luca Pacioli. One statistical study conductedin 1999 on 565 works of art by different great painters concluded that the golden ratio was not used for the canvases, and that the average ratio of the two sides of the paintings studied is 1,34, with averages for individual artists ranging from 1,04 (Goya, for example) to 1,46 (Bellini). The higher ratio is the same as that of Raft of the Medusa. Also in 1999, queen size became the most popular mattress size in the United States, overtaking the twin for the first time. 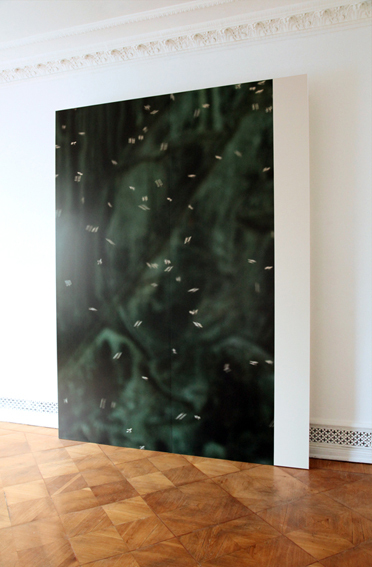 From June 26 until August 6, 2011, one large-size print of a detail of Etex's Raft of the Medusa relief and a swarm of mayflies (img_9520_crop2, 233,64 x 342cm) was exhibited at MD72, Berlin. The small-size prints of the five crops (12,82 x 19,61cm, 13,26 x 19,41cm, 14,63 x 22,66cm, 16,81 x 25,1cm, and 12,59 x 18,61cm) are reproduced in a book. The medium-size print hangs over a queen-size bed somewhere in America.